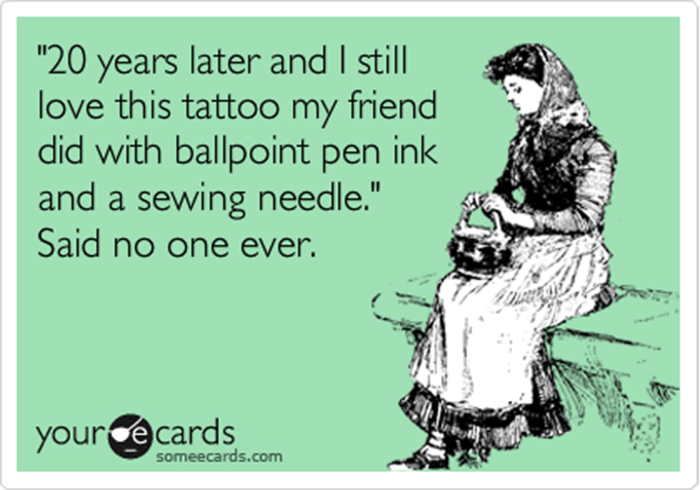 TATTOOS: Why you should never visit a scratcher? It’s a subject that causes huge debate within the tattoo industry and makes the news on a near monthly basis. The debate of the scratcher. As you can see, generally speaking, scratchers have a pretty bad reputation. And to be honest, a lot of it is based on fact. On a monthly basis scratchers will reach the headlines with yet another story of a tattoo gone wrong and a scratcher working from their kitchen. Now this isn’t good. But you also need to consider the person who thought it OK to get the tattoo from them in the first place. You wouldn’t let a dentist do a filling in their kitchen, so why would you let some one tattoo you in one? Although there is no regulated training for tattooists, common sense is the key to getting a good tattoo. Yes you might be getting a tattoo for £50 instead of £200 because they’re practising, or they can’t get work in a studio, but is it really worth it? Can you guarantee their cleanliness? Their skill? The value for money? My advice, never see a scratcher unless you really know their background and can guarantee their work and their health and hygiene procedures. It’s just not worth it. Don’t get me wrong, apprentices in studios can be just as good as a trained tattooist. I have several pieces of work from apprentices and they are excellently done and I am proud to have found their talent early on. Your tattoo should be for life. You’re putting yourself through the pain, you might as well make the most of it and make it worth it. Good tattoos aren’t cheap, and cheap tattoos aren’t good. "TATTOOS: Reasons not to have a tattoo"
"TATTOOS: Should you let an apprentice ink you?"